I have two dropdown questions on my form that contain 3,030 options each. When I first write the question into the form, all 3,030 options are visible. I have gone back now and only about 1/2 of those are still there, both on the live form and on the form builder. Help! And let me know if you are able to see the changes? Unfortunately, I cannot see the changes. Unfortunately, this did not work, either! Can you please provide us with the link where you embeded your form for us to investigate what the problem might be. Thank you. I have not embedded the form yet as it is not ready to be made public to our users. Is there another direction that I can point you to? May we know the label of your two dropdown field for further assistance? Of course! One is called "Current School Name" and the other is called "Previous School Name." Your form is working fine in my end. I do see the options of your "Current School Name" field as well as "Previous School Name". Please take a look screenshot of your form. Can you please delete your browser cache/cookies and do let us know if the said issue still persists. I have emptied both the cache and the cookies on my browser and am still having the same problem. Colleagues that I have sent the form to are also having the same problem. When you populate the dropdown boxes for both questions, does the school name go through first letter schools beginning with the letter "z"? The problem I have is that the school names are only populating through schools beginning with the letter "m."
I am not quite sure what causes the options to be cut off in half, but can you please paste the list on this site, and copy the URL afterwards so we can do further tests? Hello, I just tried to paste it to the site that you gave me, but I got an error message that reads "Your paste cannot be larger than 64kb. Sorry." Would you be able to e-mail us the list to support@jotform.com? I have also checked the content of those 2 dropdown fields in your form. The options value on both "current school" and "previous school" dropdown fields appears to be the same. I also tried pasting more values into the dropdown field to check if it has limitations on the number of entries allowed. 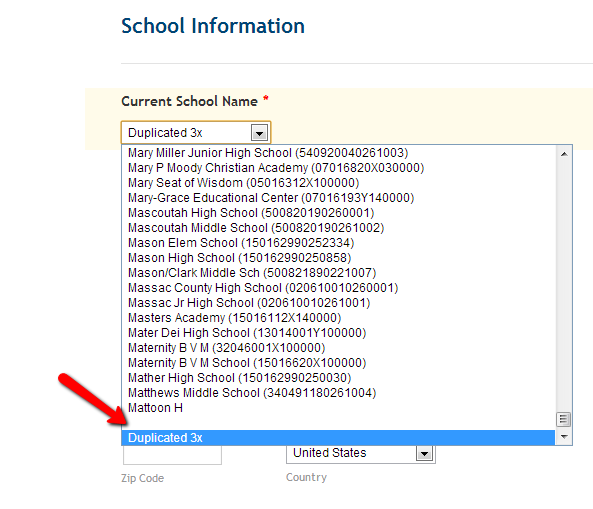 I duplicated the value of "current school" options 3x.. the form and the dropdown field still works. So far, I could not get yet the max allowed entries for that 2 fields. Perhaps the the dropdown selections are not really disappearing. Maybe the 'pasted' data/info are only that many. Please try to check again the form and the value of those fields in question. When I created these questions, I pasted a total of 3,030 fields in both drop down boxes and then immediately tested the questions in the preview to make sure all fields were populating. When I sent this URL to some of my colleagues to also test the form, the form populated only through 1,540 fields (or to "Matoon HS"). I went back to my original form to make sure that I had copied the correct number in the dropdown options and the other half or so of the fields had, in fact, disappeared. I deleted both questions and went through the same process a second time only to find that the same thing had happened. 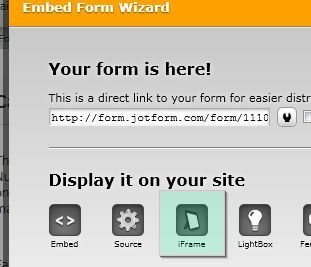 So, something is happening so that the other half or so of my fields are disappearing both on the form builder and on the form that users compelte. I hope this helps. We would like to test this. Can you please e-mail us the list so that we can clone your form and test it. Hi, EduardoMendez - I did this at about 10:30 CST this morning. I will take a look at it and start testing. I have tried to reproduce this problem without any success. I have created a simplified clone of your form and will continue to test. let us know if this occurs again. Here is the link http://form.jotform.co/form/22685753447868?